Speedy, reliable and good value service. 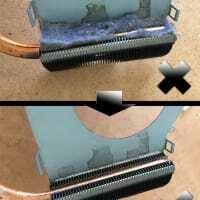 Computer repair in Sheffield. PC, Mac, Desktop, Laptop, wifi, printers etc. fixed. 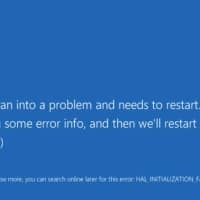 Tutoring on computers / tablets. Website design. Based in S8, callouts across all of Sheffield. 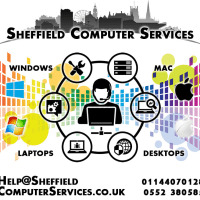 Sheffield Computer Services repair computers, laptops, all-in-ones, hybrid laptops etc. (Apple Mac, Microsoft Windows and other operating systems). Also sort out email, internet, cloud, backup, software, data recovery, upgrades, passwords issues, printers, screen replacement etc... Anything computer, techy or internet related - we can help! Based in Woodseats S8 0NL, we service the whole of Sheffield and further - callouts or drop off. Prices are on our website - we will agree before doing any chargeable work. 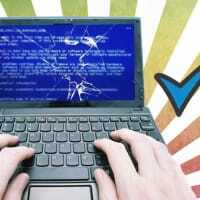 We can often get you up and running again with any software problem very quickly. People are usually pleasantly surprised with our turnaround times. 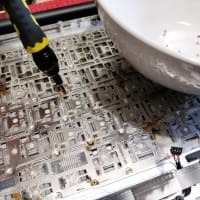 Hardware is often the same case if it is configured wrong, or a 1-3 days if a part is required from a reliable supplier (all depends on part availability). Cash or bank transfer are preferred payment methods accepted. Card payments cannot be taken due to charges we incur. Cheque payment is possible. If paying via bank transfer money is to be received before or at point of pickup. 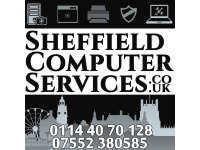 Thank you for taking time to consider Sheffield Computer Services - please feel free to give us a call/text/email for quick advice or a quote. A very high level of service. 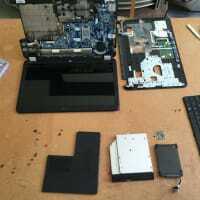 My laptop required a professional clean-up and reinstallation of all programmes. This was done promptly and thoroughly, with additional advice given, at avery fair price. I would definitely recommend this company. 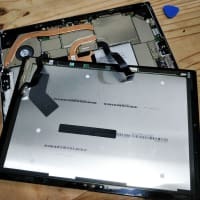 My mum-in-law's laptop screen wasn't working. 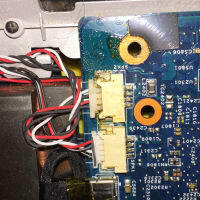 Nathaniel sorted the problem by replacing the motherboard, delivering the laptop back to my house. Great service, wouldn't hesitate to use again. Excellent and speedy service. Thoroughly recommend. I had a problem with a virtual box on my i mac and it was sorted very quickly and professionally. A fair price and i would recommend them to anyone thanks. Nathaniel is quick to respond to enquiries and offers a friendly, knowledgeable and fast service that I wouldn't hesitate to recommend to anyone who needs an expert hand. Excellent value too.